It’s been a while since I talked about the current financial situation my family is in, so here goes. Currently there is only one income, and that’s me, Joshua is currently in school and devotes all of his time to school. Luckily the majority of his classes are online and so he can be home to help with the upkeep of the home. In another blog post I’ll talk about how we handle this complete change of our roles (though it’s going very well). Living on one income is a challenge but not that we’re struggling. We’re very blessed in our circumstances, and I thank God everyday for that, but eating at home is not only the best financial decision but it’s a wise decision for our health. So let’s get down to the nitty-gritty: how we managed to eat for $30 a week! First let me disclaimer this, we are also blessed to live in the midwest, where prices remain lower then other parts of the country, now I’m sure in LA or New York you’re bill would go up a bit but try some of my theories and they might help you cut it a lot! We also shop at aldi for everything on my list but TWO things! Second I’m going to list out what our menu looks like for the month, by date, and then i’ll break down the price on things! This is for the month of September! Ok so that’s our month of September, stuff in general might move around based on the day, if Josh’s school has a heavy work load etc. but for the most part it stays pretty on point. As you can see a few things are repeated because we either love them (chicken salad), they’re super cheap (pancakes) or it’s our idea of a date time (frozen pizza). I know that seems odd but when you’re budget is low a frozen pizza and a movie can be just the perfect date for us! Now as you can see we do throw in the date night once a month, and it’s different for each family but this is what fits us! **You’ll see when I list prices that I buy one 3 lb container of beef and I divide it up, I cut it in thirds first making three 1 lb sections then two of the sections I divide in half making four 1/2 lb sections. The 1lb section goes to the hot chili (cause who doesn’t LOVE lots of meat in their chili) and the rest of my recipes get 1/2 lb sections. Again this works for my family. *** We had planned a trip for later this month so it may look like well it’s $30 a week but you’re not feeding yourself for four days (well I am haha) but I also bought groceries on the 26th of August and used the groceries to cover the end of last month two (four days to be exact). Now we can go to the fun part the actual prices! I know you’re so excited. If it’s italicized it means it wasn’t on the list and I threw it in! This was my assumed total but…. Also please go visit my link party Seasons on Saturday and add your own submissions! The party starts on Saturday at 12:01am! Come share with me!! Thank you for stopping by!!! I try to make it very easy to understand!! Very well thought out. And I love that you threw in the date night. That's a must! Thank you for sharing at the Thursday Favorite Things Blog Hop! Always have to have a date night!!! Wow this is great. It does seems like ya'll prices are a little less. I love how you took the time and explained every thing, I need to try this...because I am a very tight budget. Trish - Aldi is a HUGE saver when it comes to our groceries because the prices are so low!! That makes a huge difference for us when it comes to our budget. This is great! I actually just read an article about how Gwyneth Paltrow is doing the #FoodBankNYCChallenge which is to live on the Snap budget of $29/week. She could use some tips from you for her shopping list! I had no idea Gwyneth was doing something like that! That's awesome because honestly it's not easy. Thanks for stopping by! I always enjoy these type of posts because it is both helpful and inspirational. I had no idea the price of things in the Midwest had not climbed like everywhere else. It seems like every time we almost make the ends meet, they move the ends! A 10lb. bag of potatoes here in middle Georgia is almost $5! So glad you shared with us at Merry Monday. Please be sure to come to the new party starting tonight. Shirley- Honestly it all comes down to Aldi for us. The only movement we've seen in Aldi has been a slightly higher meat cost, but that's it! It's been WONDERFUL to have aldi's near us because it means we can accomplish so much! That is so awesome! It is so good that you are able to support your husband while he is in school and that you are making it work. I need to do better about menu planning, thank you for the resources and tips! Emmy- Serving my husband in this capacity is truly my cross right now but it's also just the season of life we're in. I don't always do it perfectly but I try to make it work for us. Menu planning can we so easy, but it takes work. I also keep "contingency" meals at the ready. Sometimes with hubby at home, his homework can get overwhelming and he needs something that doesn't require as much work. This is a great post Abigail. 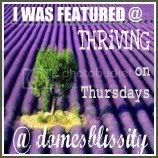 Thanks so much for sharing it with us at Thriving on Thursdays. It's great to see how others do it. I'm featuring this one at my party tomorrow. Would love to see what else you have to share. Thanks for coming.